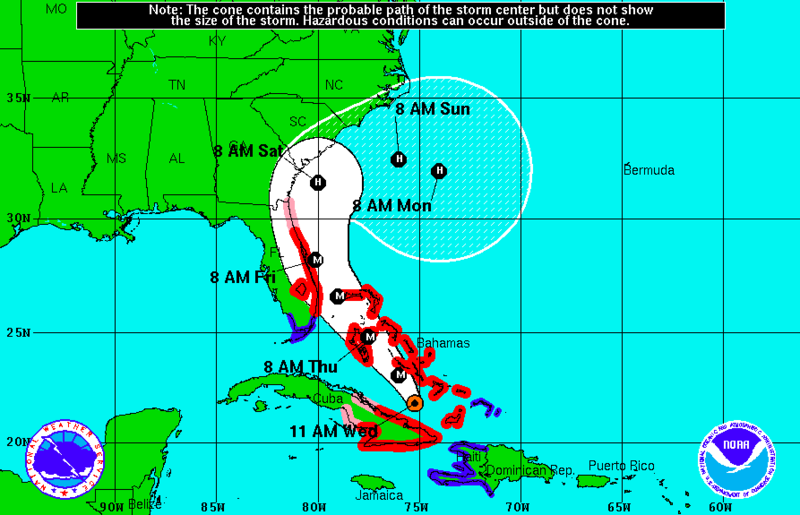 Hurricane Matthew: How Will Your Travel Be Affected? With Hurricane Matthew expected to hit the East Coast hard between Thursday and Sunday, travel plans will certainly be affected in a major way. For those with upcoming travel in the Florida, Georgia, South Carolina or Bahama Islands areas, here are some things you will want to keep in mind. Matthew is a Category 3 hurricane with maximum sustained winds recorded at 115MPH with higher gusts. Hurricane-force winds extend outward up to 40 miles from the center and tropical-storm-force winds extend outward up to 160 miles. The storm is expected to heavily impact the southern coast of Florida and then travel up the coast of Florida through Georgia and South Carolina before moving back out to sea. 2:00 AM Thursday: Just West of Exuma moving Northwest on the Eastern coast of the Andros Islands. 2:00 PM Thursday: Directly off the North coast of San Andros Island moving Northwest towards the West Coast of Freeport. 2:00 AM Friday: Directly off the coast of West Palm Beach and Jupiter, FL moving North up the Eastern Coast of Florida. 2:00 AM Saturday: Directly off the coast by the Florida/Georgia state line most likely effecting Jacksonville, FL and Savannah, GA. There will be a lot to monitor over the next couple days if you are expecting to travel this weekend as many commercial flights will be in jeopardy with weather concerns. Beat the storm and get an instant quote from Magellan Jets.